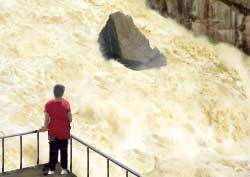 Visitors witness an incredibly loud, churning, foaming river relentlessly pounding giant boulders in its path. Tiger Leaping Gorge is an unforgettable display of powerfully intense raw nature. Tiger Leaping Gorge got its name because, legend tells us, a tiger escaped a hunter by jumping over the river. The Chinese name of Tiger Leaping Gorge is Hutiao (pronounced who-tee'yhow). Tiger Leaping Gorge is 15 kilometers (9 miles) long with many white water rapids. This rocky gorge is flanked by mountains on both sides that sharply rise 3,000 meters (10,000 feet) above the river. The canyon's narrowest point is just 30 meters (100 feet) wide. It has a riverside observation platform for upclose viewing. There, the river water sounds like a roaring angry monster. Spring is by far the best time to visit Tiger Leaping Gorge because the river turbulence is at its peak (melting snow flows down from the Himalayan mountains). Fall is the second best period because of its generally pleasant weather. Rains are heaviest during late summer.